(Photo by Will Parson/Chesapeake Bay Program) Watershed specialists Carlos Rich, top, and Dawayne Garnett from Groundwork Anacostia River D.C. work to empty a Bandalong Litter Trap at Kenilworth Park in northeast Washington, D.C., on Oct. 1, 2014. The Groundwork Anacostia River D.C. (GWARDC) introduced the Bandalong Litter Trap to the Anacostia River. It was the first of its type in the Western Hemisphere. 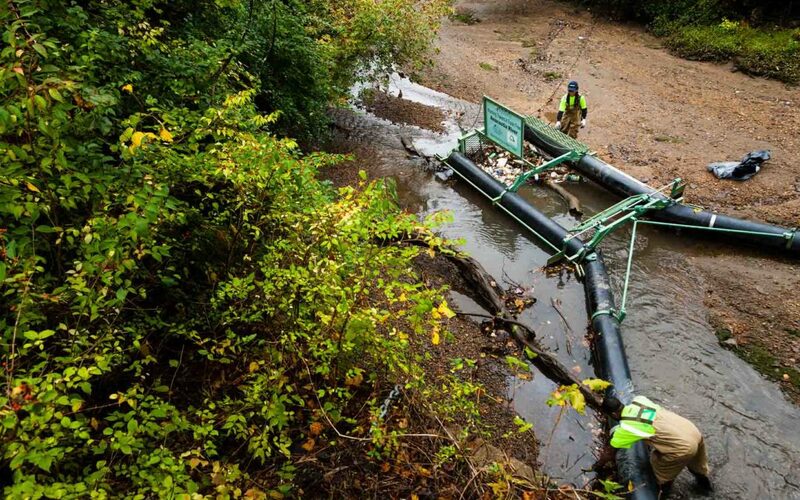 The trap is installed on Watts Branch Creek, a tributary of the Anacostia River. The Anacostia River flows through Washinton D.C. and empties into the Potomac River, and ultimately ends up in the Chesapeake Bay. GWARDC is hopeful that seeing the effectiveness of the trap will encourage other communities to work with one another to clean the river.